RINGMASTER: King Patrick Eugenio is the star of San Jose’s Underground Wrestling Alliance and the host of the regular Circus of Sin burlesque nights at The Caravan. Let’s get weird… Join us for an exploration of the bizarre mind of Silicon Valley’s oddest oddball—King Patrick Eugenio, the gender-bent star San Jose’s of the Underground Wrestling Alliance and host of the regular Circus of Sin burlesque nights at The Caravan Lounge. We’ll talk about the bumps and bruises he incurs in the ring, the sideshow acts he brings to his circus and learn more about what makes him tick. PIZZA PIZZA: This pie from Pizzette 408 is just one of the many options you have for great pizza in Silicon Valley. This week sucked. Fortunately, there’s still pizza. This week, we talk about local and national politics, as usual, before jumping into a very comprehensive rundown of 57 of the South Bay’s best pizza joints. Thin crust, thick crust, veggie or mega meaty—it’s all here. Also on this week’s podcast, we remember Tom Petty, talk about Hardly Strictly Bluegrass and take a look at an upcoming show at Shoreline featuring Nas, Ms. Lauryn Hill, Hannibal Buress and Dave Chappelle. San Jose Sharks forward Tomas Hertl. Photo by Dave Lepori. In a yet another wild week of news, the Metro SV411 Podcast takes a deep dive into … sports? Sports! TOTAL DERF: Artwork by John ‘Derf’ Backderf. On this week’s SV411 Podcast, we discuss the Alternative Press Expo, which brings acclaimed alternative comics creator John “Derf” Backderf to town. His grotesque style is often compared to the work of R. Crumb. Also: special guest Congresswoman Zoe Lofgren speaks with Metro editor Josh Koehn about President Donald Trump’s mental instability, her resolution to get him a mental evaluation, the fight to protect dreamers after the rescission of DACA, and who she thinks is ready to lead the Democratic Party come 2020 (hint: Al Franken). ON THE BEACH: Gary Griggs’ new book, ‘Coasts in Crisis,’ exposes the fragile state of the Earth’s shorelines. Nearly half of the humans on this sweet planet—three billion and counting—live in Earth’s coastal zones. But between 2000 and 2010, new building permits were issued at a rate of 1,355 per day in shoreline counties across the U.S. Increasing coastal development is setting the stage for a precarious future. Indeed, we’ve already begun to see its impact. SLAM: San Jose’s very own Mighty Mike McGee. Photo by Greg Ramar. As a heat wave surges through the South Bay, people are seeking out ways to stay cool. 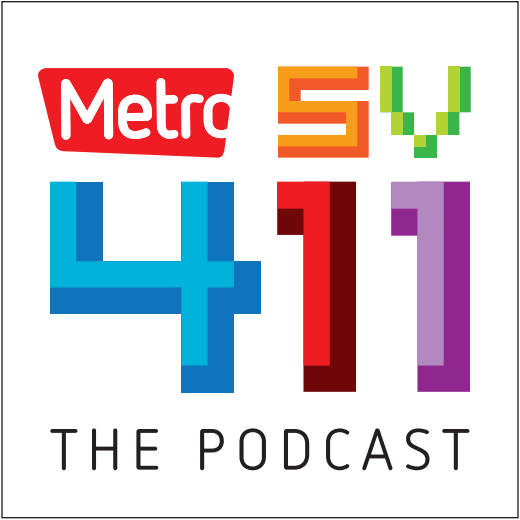 Shockingly, they might have overlooked the soothing sounds of Metro’s SV411 Podcast. This week editors Josh Koehn and Nick Veronin discuss a cover story profile on standup comedian, poet and emcee Mighty Mike McGee. We also take a closer look at allegations of sexual abuse by a recently deceased and celebrated teacher at Bellarmine Prep, as well as the continued upheaval at the county’s largest nonprofit for child and senior care. The podcast then takes a deep dive into local politics by sitting down with Dave Cortese, president of the Santa Clara County Board of Supervisors. (If you don’t want to wait for that, jump to the 26 minute mark.—Editor) Topics discussed include the county’s lawsuit against the Trump administration, who’s responsible for the systemic issues plaguing county jails, the lack of compassion in how homeless residents are treated in Santa Clara County and Cortese’s plan to run for a seat in the state Senate in 2020. Last, Josh and Nick run down the top nightlife events for this weekend, including shows at The Ritz and the 2nd Annual Sonido Clash Music Fest taking place Sunday at Mexican Heritage Plaza. Let us know what you like, dislike (hate is such a strong word) and if there’s anyone you’d like us to have on the show. Thanks for listening and stay cool. FAIR SHARE: A Slice of New York is now allowing its employees to participate in the company as a co-op and share in the profits. Photo by Greg Ramar. A Slice of New York is, depending on who you ask (Josh, looking at you), perhaps the best pizza joint in San Jose. Now, they want to be the most progressive. On this week’s SV411 Podcast we discuss ASONY’s plan to share their company with their employees, turning the organization into a co-op. Also, Josh talks with San Jose Mayor Sam Liccardo, and the Hit List includes Silicon Valley Music & Taco Fest, an outdoor screening of “Nacho Libre” and how to safely view Monday’s solar eclipse. HE’S GOT THE FUNK: George Clinton headlines San Jose Jazz Summer Fest. None other than Dr. Funkenstein joins us for this highly musical edition of the SV411 Podcast. This week Nick and Josh talk about the return of the annual San Jose Jazz Summer Fest, and Nick is joined by Parliament-Funkadelic ringleader George Clinton. Also: Kendrick Lamar, Atmosphere, Willie Nelson, and the San Jose couple who bought a San Francisco street.